Utilizing INTERAC to Avoid Overpayment of AP Invoices - Intersoft Systems, Inc. Prevent over payment of Accounts Payable invoices by providing access to all the relevant documentation to project managers and the management team so that numbers could be verified prior to payment. Manpower and time to scan and attach documents. Ability to easily search for and locate documents in the system. Need for access to a variety of documents including invoices, contracts, insurance information, and correspondence. The INTERAC Document Management System (DMS) and Job Manager provided the solution to address the problem and alleviate these key concerns. DMS was implemented with a primary goal to prevent overpayment of AP invoices. This goal was achieved with several additional benefits for the entire team. The Approval System significantly enhanced the process, allowing invoices to be sent directly to the appropriate personnel for review and approval. Time saved in filing and retrieving paper documents makes up for time spent scanning. Because documents in DMS are associated with the appropriate records within INTERAC, they are available for instant recall directly within each application as well as in Job Manager. 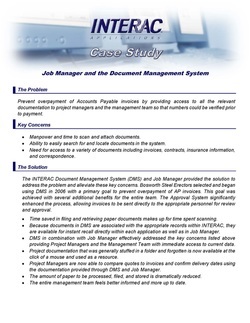 DMS in combination with Job Manager effectively addressed the key concerns listed above providing Project Managers and the Management Team with immediate access to current data. Project documentation that was generally stuffed in a folder and forgotten is now available at the click of a mouse and used as a resource. Project Managers are now able to compare quotes to invoices and confirm delivery dates using the documentation provided through DMS and Job Manager. The amount of paper to be processed, filed, and stored is dramatically reduced. The entire management team feels better informed and more up to date. “It seems that the obvious reasons to implement a system such as a Document Management System would be to save file space, save time, and offer convenience. We actually decided to purchase DMS for a less obvious reason. We purchased the program with the intentions of providing our Project Managers with yet another tool to maintain accuracy, prevent errors, and prevent overpayment on AP items. However, quickly after implementation, we also realized the more obvious benefits of the program. We found less time being spent filing and loads of information available with the click of a mouse. DMS has been a wonderful addition to our company. We’ve seen benefits in nearly every department in our home office. From Payroll, to AP, to Project Management, all the way to the owner, we all feel much more informed and up to date on job related information. In the past, many contracts, insurance information, correspondence etc. were received and simply filed away in a job file. Often times the file was never pulled to ensure accuracy. Now, with the click of a button in Job Manager, the Project Manager, VP, or owner can click on any of these items and view it on their screen. We’ve seen the most benefits from DMS in scanning our AP invoices. Because the invoices are scanned at the time they are keyed, any Project Manager can view the invoices at any time through Job Manager. They can compare prices and quotes from the past, check delivery dates, etc. Even though it was possible to verify this info in the past, it required walking back to AP, pulling a specific invoice and check copy and researching at that point. Therefore, seldom did anyone take the time or effort to do this. With DMS, there is no doubt we’ve saved significantly by scanning the invoice copies. The owner enjoys reviewing scanned invoice copies periodically in his down time to ensure we are receiving accurate pricing on such items as rentals, fuel, and material. Because of the time we’ve saved rooting for job files and sifting through paperwork, we feel the time spent scanning items in DMS has not impacted our work load much at all. It seems to be a wash, less time spent searching for paperwork, and slightly more time spent scanning. Enables timely invoice review and approval, and improves accuracy. Makes documentation readily available to the entire team. Is a very cost effective solution.